Finger touch interactivity – no pens required! In addition to interactive pens, it is now possible to operate intuitively using your fingers on the screen (EB-595Wi only) – now you can annotate, open and close files, scroll through pages, move and enlarge objects. Basic projector operation (power OFF, source change, volume up/down, A/V mute, etc) can be done by simply clicking the icons shown on the new on-screen operation toolbar. 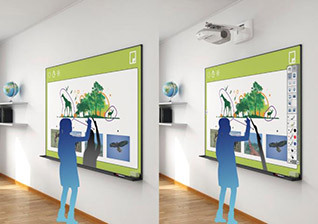 Now there’s no need to look for the remote control, when the projector can be easily operated directly from the screen! Even when you stand directly in front of the screen, the light rarely reaches your face. 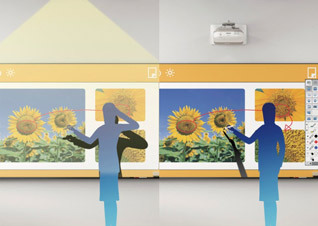 With no glare in your eyes, you’ll find it far more pleasant and stress-free to be out front when using the projector.